Unless you’ve had your head up in the clouds, you’d be across the news that the Torquay Hotel has become a serious music hub these days, especially with their recent Torquay Hotel Summer Series which saw the iconic regional music venue host a specially curated season of incredible Australian music. Well proving that this is one regional music venue here to stay, they’ve launched into the cooler season with their epic ‘Surf Series’ which are bringing another slew of high caliber acts to their roster. Hosting DZ Deathrays just last week for a sold-out event, the team are back with a cheeky double whammy next week with none other than Skegss and The Chats for not one, but TWO shows. 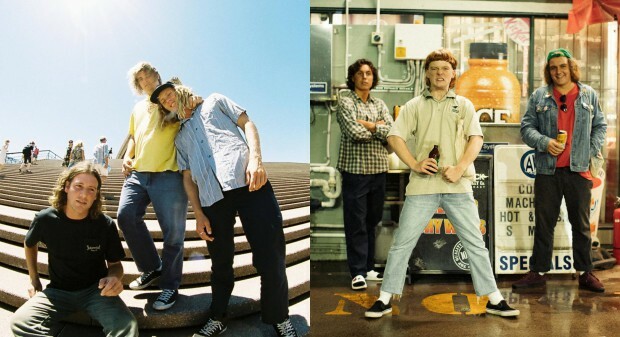 Skeggs has made a name for themselves with energetic live performances, garnering praise from The Music for their “infectious” on-stage chemistry and Moshcam who asserted they “seem to have some sort of hypnotic effect over their fans.” Skegss have played at festivals across the country and overseas including a headline slot at Sounds of the Suburbs, Splendour in the Grass and the upcoming Groovin’ The Moo circuit to name a few. After selling out their 2018 tour including 4 shows at the Croxton, and absolutely slaying crowds across the recent Laneway Festival Tour, this is a very rare pub gig for them so don’t miss it. As for The Chats, they need no introduction. These three dropkick drongos from the Sunshine Coast of Australia went viral for their track ‘Smoko’, and mayhem followed. Now reaching over 5.5 million views, the tune has lead to a whirlwind touring schedule of 2018. And don’t even get us started on their newest track ‘Pub Feed’. Not only was the world keen to see if The Chats could back up their viral hit Smoko, but most people were also pretty thrilled to find it’s follow up was a right old ear worm. Channel 7 Sunshine Coast even broadcast the new vid on the nightly news, setting a dangerous precedent for emerging bands, worldwide. If you saw The Chats as part of Torquay Hotel’s Summer Series you’ll know this one is not to be missed. Unsurprisingly though, the first show (Thursday, April 18) sold out in record time, leaving those last-minute fans high and dry! Luckily the Torquay Hotel are a bunch of legends, and they’ve decided to add a second show the day prior on Wednesday, April 17. You’re gonna have a hard time trying to find a better night out than a crusty chicken shnitty, cold draught beer and live set from these acts. Tickets for the second show can be purchased here.